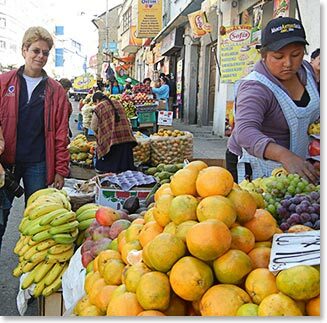 Our team has arrived in La Paz on Saturday, June 26, very early this morning. 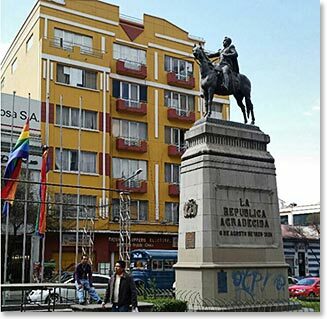 After a brief rest at the hotel and an expedition briefing with Osvaldo Cortez, Chris decided to wonder the streets of this busy city, taking in the sights and sounds. One thing she noticed was the rainbow flag was flown at several locations, honoring the victims of Orlando shooting. 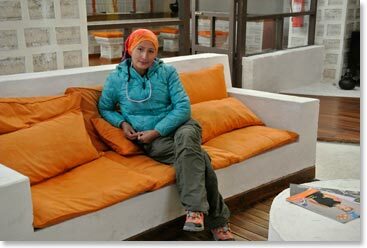 The following morning the team boarded a flight to Uyuni. 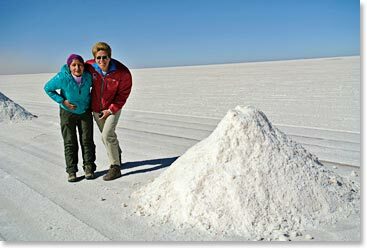 They spent 2 days visiting the Salar - part of their acclimatization process. 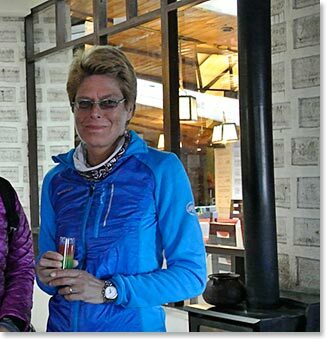 So far only one member felt the altitude but after starting on Diamox, she was feeling great quite shortly. Being the dry season, the Salar was quite dry. 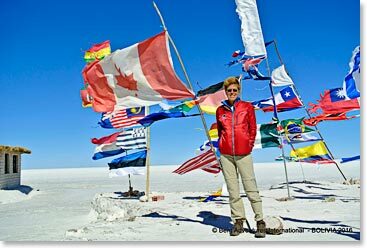 When they arrived in Uyuni they experienced an intense wind storm with flowing sand +wind. 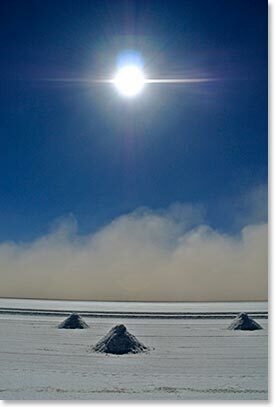 So, our usual picnic on the Salar was not an option. 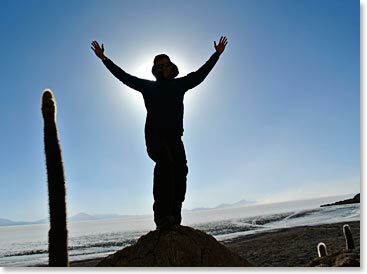 Salar de Uyuni is the world’s largest salt flat. 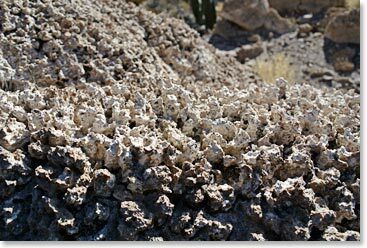 A prehistoric lake that went dry leaving behind a landscape of bright white salt, rock formations and cacti islands. On this image you can see the wind storm approaching our team. 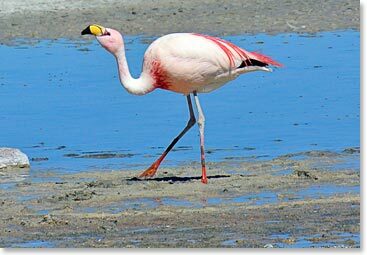 Although wildlife is rare at the Salar you can see many pink flamingos. 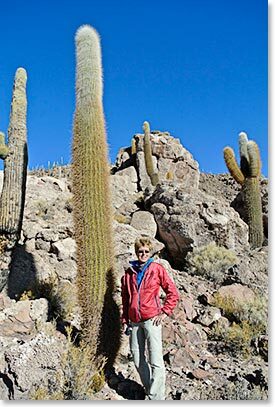 Saturday afternoon we visited the Lomo de Pescado Island where we did a great hike among gigantic cactus. 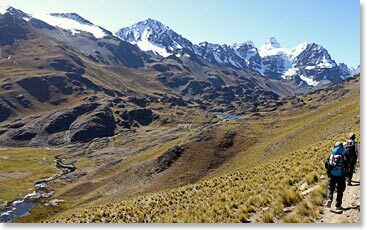 Monday, June 27th, we left right after breakfast on our 4x4 and drove to Vulcan Tunupa to 4,050m where we started our hike to a high point of 4,750m. 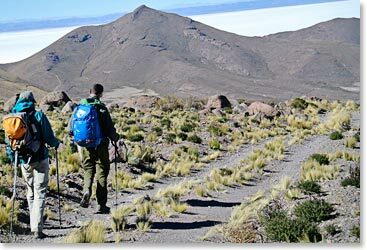 From our high point we were able to see the colors of the crater as well as the magnificent views of the Salar. 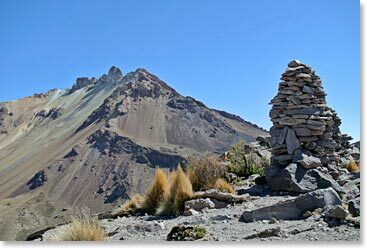 Great acclimatization hike - Tunupa High Point at 4,750m. We then returned to Jirira where Maria was waiting for us with a great lunch and soon after we left for our hotel, the Palacio de Sal. 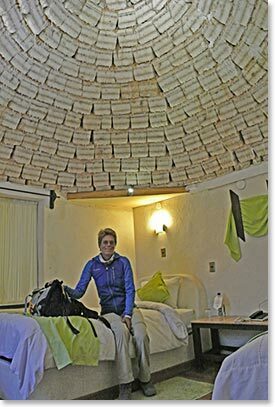 Check in at our hotel, Palacio de Sal. We were served an interesting drink, a mix of 3 different juices. The room at the Palacio de Sal is always a success with our team, hard to believe that we will be sleeping in a room made of salt. 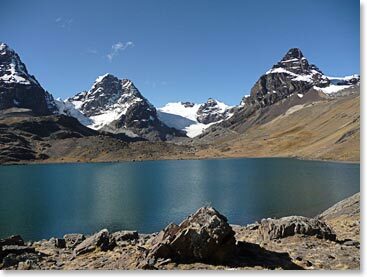 On June 28 we all flew back to La Paz where we had a transfer waiting for us that took us to our next destination. 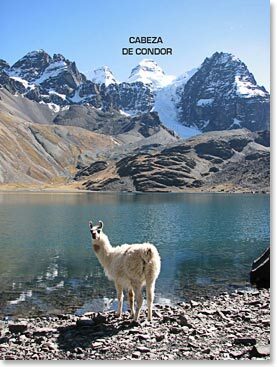 We hiked to Condoriri Base Camp where we are getting ready for our next goal. Climb Cabeza de Condor. 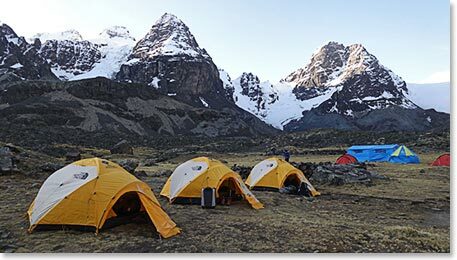 Tomorrow, June 29th, we are climbing to high camp where we will spend the night before attempting the summit. Due to extremely dry conditions we will have extra guides support. 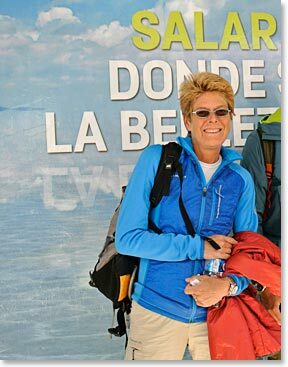 One member of our team is staying at Condoriri base camp where she will be enjoying Maria’s cuisine and following the progress of the team summit attempt. Stay tuned! We will have news of our attempt in the next couple of days!